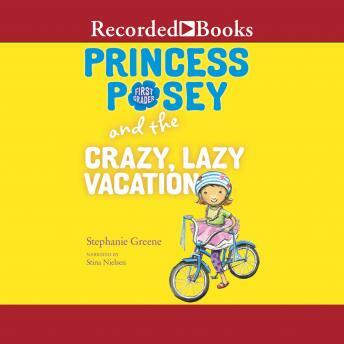 Lots of adventures await everyone's favorite first-grader, Princess Posey, on her anything-but-boring vacation! Posey's classroom is abuzz with everyone's travel plans for the upcoming spring break. But Posey is worried: instead of going away for their vacation, her mom says they are going to have a "lazy vacation" at home. What if lazy actually means boring? Fortunately, the next few days are anything but: there are pancakes for dinner, a loose tooth, a sleepover with her friends, and a new bike without training wheels! After Posey's first attempt at riding ends with a crash, she's not sure she wants to get back on her bike. But with some encouragement from Grandpa and help from her sparkly tutu, Posey realizes that being brave means trying again, even if you feel afraid. The final thing Posey learns after her adventurous week: it's impossible for a first grader to have a boring vacation!